These are so delicious and so easy. 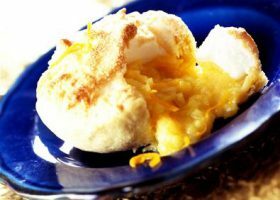 They are similar to a more traditional lemon meringue pie. They are great served for pudding or as part of a special meal or eaten cold as a treat. This pastry is very easy if done in the processor. However, if you prefer to do it by hand, simply place the flour and salt in a bowl and rub in the butter using your fingers. The pastry: Place the flour, salt and butter into a food processor and mix until it resembles fine breadcrumbs. Slowly add a little cold water and mix until mixture forms a soft dough. Wrap in cling film and chill for 30 minutes. Lightly grease the bottom of 4 small ovenproof ramekin dishes or dariole moulds and place upside down on a baking tray. Roll the pastry out on floured surface to approx 0.5cm thick. Cut out 4 circles, slightly bigger that the bottom of the ramekin dishes, place the pastry over the dishes and gently press it over and around the bottom of the dishes. Place on a baking tray and cook in an oven preheated to 200C/gas 6 for 25 minutes until golden. Lower temperature to 160C/gas 3. Allow pastry cups to cool then carefully remove the pastry cups from the dishes. The filling: Place the apple slices in a large pan together with the sugar, orange zest and juice. Gently cook over a medium heat for 10 - 12 minutes until the apples have softened and are pulpy. Remove from heat. Add the egg yolks, one at the time, beating well after each. Divide the mixture between the pastry cups. Whisk the egg whites in a clean, grease-free bowl until stiff peaks form. Add the sugar, a tablespoon at a time until mixed in. Spread on top of the apple 'cups', swirling with the back of the spoon as you go, making sure the apple is completely covered. Place on a baking tray and bake for 10 minutes until meringue is lightly golden. Serve with ice cream or cream.